Walking through the door of the Merle M Mitchell VFW Post 3715 in Maryvale was like taking a step back in time. The blazing Arizona summer heat gave way to somewhat cooler darkness filled with the lazy swirl of smoke and low music. Patrons turned warily toward the door deciding whether they should greet or guard. Marty, the Canteen Manager for the past 15 years, asks, “Can I help you?” We answer, “You already did and we are grateful. Now we want to help you.” They relax. And then later, they smile. 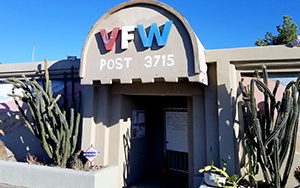 Housed in a 50+year-old-building, VFW Post 3715 has been a gathering place for West Valley Veterans for over 30 years. Awarded as ‘Best Post in District 3’ with more than 200 members, they’ve raised funds for ailing and fallen comrades, mourned the passing of many friends, hosted fish frys on Fridays, and supported their community schools for many years. Unfortunately, this community treasure – while maintained as well as limited funds allowed – was slowly falling apart around them. Inside and out, the building showed its age. Though freshly painted, the stucco was cracked and failing. Its proud old flagpole rusty and worn. Inside, paint peeled from faded walls while old asbestos tiles rolled in waves across the floor. Electrical wiring snaked up and down the walls, through windows, and over the roof. In honor of our veterans, we wanted to restore the Merle M. Mitchell VFW Post 3715 to glory. And with help from our generous community partners at Albertsons, Honeywell, and Sears, VFW Post 3715 is ready for duty once more! Teams from Albertsons and Honeywell volunteered time and the money needed to paint, lay new flooring, construct walls, repair doors and patch stucco. Thanks to Sears, the faulty wiring was replaced and is no longer a fire hazard. Meet Stephen, a 47-year-old disabled veteran who served honorably with the U.S. Army. After suffering serious physical injuries, he was discharged from service and through sheer determination, fought his way back to health. He bought a small, foreclosed, fixer-upper home in Maryvale but found the cost of repairs far greater than he ever anticipated. 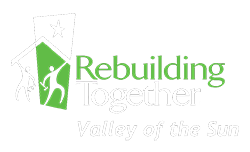 Stephen learned about our Critical Home Repair Program serving veterans through his community association and sent us an application. We invited our friends at Home Depot along for a visit. With military honors and medals proudly displayed on the walls, the interior condition of his home seemed even more tragic. The range had one working burner. Kitchen cabinets with no doors clung precariously to the wall. The floor had been stripped down to bare concrete. Single-pane windows were sealed shut by years of heat, paint and dirt. The front door had been kicked in and sagged badly on the hinges. Home Depot and the Team Depot volunteers rose to the challenge asking, “How can we help?” Thanks to them, Stephen’s family can ring in the new year with new windows, doors, kitchen cabinets, a working stove and flooring. He is so very grateful. 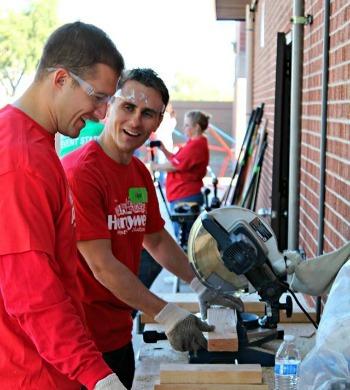 People like Stephen are at the heart of our free Critical Home Repair Service Program. 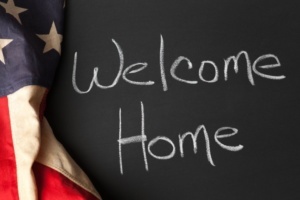 We are honored to serve veterans and their families as we work to create a safe and healthy home environment. The voice on the phone broke as she explained the reason for her call. Her words chilled us to the bone. Just the day before, a couple had tragically perished in similar circumstances. We knew having a wheelchair access ramp might have allowed them to escape and survive. 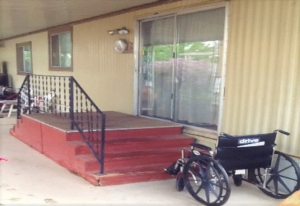 The Arizona Ramp Project provides FREE, custom built and installed, ADA compliant home access ramps for low-income seniors and veterans. These ramps increase safety and independence, reduce isolation and allow homeowners to age safely in their own homes. Our goal is to make sure that no one EVER wakes up in the middle of the night, in a home filled with smoke, knowing that they have No. Way. Out. But we can’t do it without you. Help make our goal a reality. We invite you to invest in the Arizona Ramp Project by making a gift today. Just $1000 provides an escape route for someone’s grandma. Let’s make sure everyone has a fighting chance. Oh, and Ellie? The great-great grandmother whose story broke our hearts? We are happy to report she sleeps more soundly now that she has a brand-new, custom-made ramp and smoke alarms in her home. On her behalf, Thank You for the gift of independence.